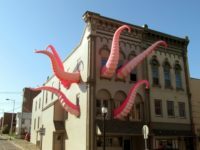 The Kraken Invades the Old Iowa Capitol! This event is family friendly, FREE, and open to the public. Calling all ghouls and goblins! The University of Iowa Pentacrest Museums—Old Capitol Museum and the UI Museum of Natural History—in collaboration with the UI Department of Geoscience, will host the sixth annual Creepy Campus Crawl this Friday, October 28. This ghostly night, full of spooky fun, is free and open to the public and will haunt the three locations from 6:30–8:30 p.m. 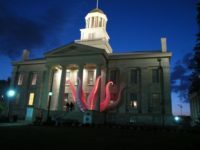 The University of Iowa Old Capitol Museum is being invaded by The Kraken! 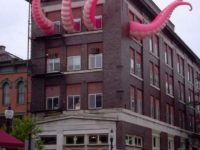 The Kraken, otherwise known as the Muscatine River Monster, will be on display on the Old Capitol Museum for the sixth annual Creepy Campus Crawl on Friday, October 28. 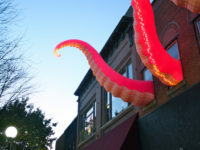 The Kraken will appear on the Old Capitol building by 5:00 p.m. and will remain on display after the annual Halloween party, 6:30-8:30 p.m., until 10:00 p.m.
For more information on the Creepy Campus Crawl or the Pentacrest Museums please visit our websites, www.uiowa.edu/oldcap or www.uiowa.edu/mnh. 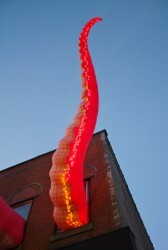 Well, we’re going to temporarily update MC Ginsberg’s product lines to include Giant Tentacles! I’m going to spend Thursday (Oct 27) stuffed into a rooftop terrace overlooking East Washington st, downtown Iowa City. Stop by and wave hello! More visits this week in Iowa City…which I will announce just before they happen so keep watching. The Kraken live on CBS-2 morning news! Edit 2011-10-27: Watch a highlight from the newscast! Hey! Just a quick heads up that KGAN CBS-2 news from Cedar Rapids is scheduled to do their Thursday morning LIVE news cast with me in the background! They’ll be showing off a little bit about where I come from, how I work, and what I mean. KGAN will be broadcasting live from my new spot. I’ll appear Thursday morning on a new location somewhere in downtown Iowa City…see if you can identify where! Hope you can catch it! Want to sponsor a Kraken visit to your location?